Wire shelves from an old refrigerator, freezer or oven, or closet organizers protect openings. A used appliance stores may cheerfully give you shelves they are about to send for recycling! 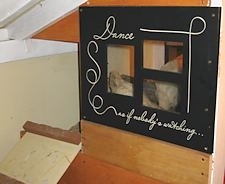 Spray painting wire with black paint makes it much easier to see through--for you & the chickens! Common picture frames can make cute openings. Thrift stores offer many inexpensive choices. You can keep the glass in the frame if it will be in a non-vulnerable location, or replace it with wire. Include vents both high and low in the coop. In hot weather, it is critical to keep chickens' coops cool. Coops also need sufficient ventilation to regulate humidity, which not only can foster disease but also chills birds in the winter more than dry air. Build some openings under the coop eaves where they are protected from wind, and build some lower openings that can be closed in cold weather. In summer, hot air will rise out the high openings, drawing cooler air in through the lower openings. Birds are very vulnerable to cold drafts. Be sure the locations of openings will not cause air to flow across nighttime perching areas. Wood screws--the kind that have a gold-ish / brassy color coating. Tips: Some hardware stores sell these by the pound, which is cheaper than buying in boxes. Tip: Pre-drilling screw holes helps prevent splitting in older or thin wood, and makes thick wood easier to penetrate. Having two cordless drills to use greatly speeds up the work. Fencing staples, wire staples or bent-over nails. Strips of trim boards laid across the edges of wire and secured with screws. Small strip of wood (3-5 inches) with a screw in the middle to act as a twist latch, which prevents chickens from getting injured on pointy metal latches. Metal washers. Note: It may be difficult to find some with a center that is small enough to prevent the head of a wood screw passing through. You can stack a small washer on top of a larger washer to help solve this problem. Please visit later for more Chicken Coop Tips!